Welcome back to our ongoing timeline of Dragon Gate’s heel units, covering all nine such factions in DG history. Back in Part 1 we covered the first three: Aagan Issou, Blood Generation, and Muscle Outlaw’z. Since all of the heel units starting with Blood Gen lead directly into the next one, I highly suggest you read Part 1 before continuing on here. Today we’ll talk the middle three heel units: Real Hazard, Deep Drunkers, and Team Doi. Let’s get going! So we left off at the end of the Muscle Outlaw’z back in May 2008. The two unquestionably top ranked wrestlers (only Gamma really comes close via his questionable King of Gate win from December 2007) Naruki Doi & Masato Yoshino- in many ways the signboard players of the unit- had been at odds with the rest of the group for many months in 2008. This lead to them officially withdrawing on May 9th, declaring that they intended to start their own unit, which would end up being WORLD-1. Everyone pretty much knew their first member would be Naoki Tanizaki, another ex-MO’z wrestler who had just returned to Dragon Gate a few months earlier after leaving at the end of 2006. Naoki had been aided by two masked Dr. Muscles, who were clearly Doi & Yoshino, a few shows earlier. Meanwhile, the last four members of Muscle Outlaw’z were now Gamma, YAMATO (who had joined back in April after betraying New Hazard), Genki Horiguchi, & Yasushi Kanda. Speaking of New Hazard, a quick background on that unit: back on April 17th, 2007, the Typhoon and Muscle Outlaw’z units were facing off in a huge 7-on-7 elimination match. Leading up to that big match, CIMA of Typhoon and Doi of MO’z had both promised someone would betray the other unit. The match went on as normal until Typhoon won, after which BxB Hulk turned on CIMA and attacked him. Before anyone could think Hulk was joining MO’z, however, Cyber Kong then attacked Gamma, turning on that unit as well! As it turned out, CIMA & Doi were both right! Hulk & Kong then shook hands and announced the formation of a new, DG trueborn-only unit; in another words, membership would only be open to the young wrestlers who debuted in Dragon Gate, not the rest of the roster that had been active before the switchover from Toryumon (with the addition of some gaijin help and also Shinobu, an outsider who was also the original Super Shenlong). They announced Shingo Takagi & YAMATO, who were both wrestling in the US for ROH at the time (Shingo, if you’ll recall, had been gone since the end of Blood Generation/beginning of Muscle Outlaw’z back in the summer of 2006, save for a few one-off matches he came to Japan for before heading right back to America), were returning to Dragon Gate to join them, and the foursome was set. 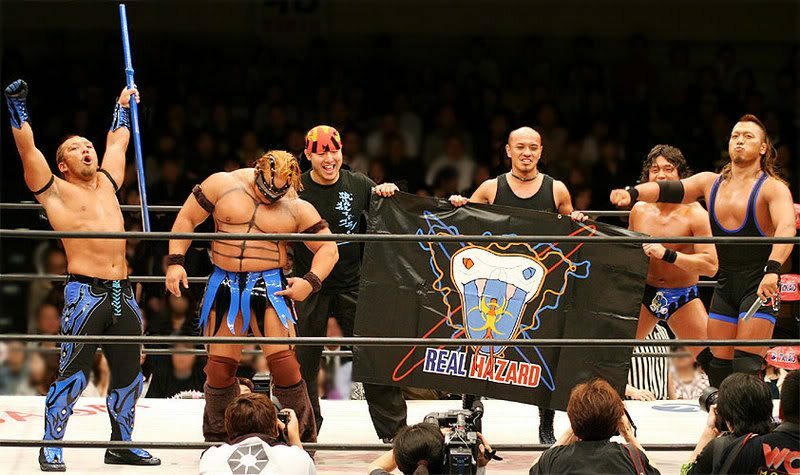 New Hazard was a very succesful unit, shaking up Dragon Gate and producing one of my personal favorite time periods. The three-way Muscle Outlaw’z vs. New Hazard vs. Typhoon feud raged throughout the rest of 2007 and produced a lot of really entertaining matches. Along the way the trio of Shingo/Kong/Hulk won the Triangle Gate titles twice, and the team of Shingo/Hulk won NOAH’s GHC Jr. Tag Team Titles from Yoshino & Doi (who had won them in NOAH and were now defending them in DG) as well. However, there was trouble beneath the surface: YAMATO, who had long been the most heelish member of the tweener faction, resented Hulk’s spot on all these championship teams, feeling he was clearly stronger and should be there in his place. After months of dissension seemed to be put temporarily aside when Takagi brokered peace between he and Hulk, YAMATO suddenly turned on New Hazard a few days later (April 17th, 2008) to join the Muscle Outlaw’z. What remained of New Hazard- Hulk, Shingo, and Cyber, plus their outsider friends who aren’t important to this story—promised to be united as they made YAMATO pay for his betrayal. This united front finally lead to Shingo & Cyber agreeing to appear as “BxB Shingo” and “BxB Kong” on the 5/14/2008 Korakuen Hall show, as Hulk had wanted for ages. For one night only they would dress just like Hulk and then the three would perform Hulk’s signature dance together prior to their scheduled defense of their Triangle Gate titles against the Muscle Outlaw’z trio of YAMATO, Genki Horiguchi, and Gamma. Shingo and Hulk performed the dance as promised before immediately turning on Hulk, beating him down. They shook hands with Gamma and YAMATO, announcing the formation of a new unit: Real Hazard, bringing together NH’s Kong & Shingo with the remaining MO’z members YAMATO/Genki/Gamma/Kanda, bringing both units together. Doi & Yoshino quickly came to Hulk’s aide, resulting in an impromptu match being booked to determine new Triangle Gate champions. Shingo, YAMATO, and Gamma defeated Doi, Yoshino, & Hulk, Shingo pinning Hulk, to give Real Hazard a set of titles on their very first night. So as it turned out, YAMATO “betraying” New Hazard turned out to be a swerve. Shingo revealed he had felt all along that Hulk was weak, and once they had lost the GHC Jr. Tag Titles back on March 20th (the titles returning to NOAH) he had begun looking for a way to rid himself of the weakling and this plan is what ultimately came to fruition. Hulk greatly resented Shingo for this betrayal, essentially turning what had been a generational rivalry before they put that aside at the start of New Hazard into a long blood feud that continues through to this day. The two have never been in the same unit together since, and it’s almost eight years later now; Hulk has also frequently brought up the turn here as the biggest reason why he hates Shingo. You may have also noticed that some of the themes here- Shingo feeling one of his unitmates was too weak and creating a unit dedicated to how only the strong survive (“the law of the jungle, the stronger” opened up Real Hazard’s theme song, BREAK ON THROUGH)- were repeated seven years later in the formation of VerserK. Anyway, we now have a new top heel unit, although from the start Real Hazard felt less like a new unit and more like a continuation of MO’z. Maybe it’s because 4 of the 6 members had been in MO’z at the end and another (Kong) had a short stay in the unit earlier as well. Maybe it was because the color scheme was sort of similar (MO’z had been blue and yellow, while RH was blue/black/red). But either way, this felt like sort of a natural continuation of where MO’z had been going anyway: no DoiYoshi, but with the additiofn of Shingo to help replace them. This wouldn’t necessarily have been a bad thing…..had Shingo stuck around. But stick around Shingo would not, as he left the unit relatively quickly. While the circumstances behind it were outside of their control to a degree, I still feel as if what they ended up doing was ultimately the wrong move, both for the unit and for Shingo. So here’s what went down: we were building up to the annual Kobe World Hall show in July 2008, and the main event was clearly going to be CIMA vs. Shingo for CIMA’s Open the Dream Gate title, as the mentor faced his former protege-turned-new top heel. On June 29th, Shingo and Hulk were booked in a match to determine the #1 Contender for the Dream Gate, but surprisingly the two of them went to a 1-hour time limit draw. CIMA had been previously diagnosed with a neck injury and was hoping to be ready in time for World, but instead made the announcement his injury absence was going to be longer than he first anticipated, and vacated the Dream Gate (he would in fact not return until a one-off match December 28th, and then not full time until March 1st, 2009). Immediately it was announced Hulk and Shingo were now going to meet in a rematch at World, with the winner becoming the new Open the Dream Gate champion. Shingo defeated Hulk in that year’s World main event to claim the vacant title, his first reign as Dream Gate champion. But this was not going to be DG’s second-ever heel Dream Gate reign, as he immediately turned face after the match by saving his former mentor CIMA, who was attacked while on commentary by Cyber Kong. This had been teased a few weeks earlier at Korakuen Hall, when Shingo saved CIMA from a forced haircut by his other RH teammates and Tokyo Gurentai. In addition, Shingo shook hands with Hulk and proclaimed he wasn’t weak after all right after their title match (this thaw in their relations would only turn out to be temporary, it should be noted- things got nasty between them again very quickly), so Real Hazard announced they were kicking him out of the unit for showing compassion to both Hulk & CIMA. This, in my mind, is where DG really went wrong with Real Hazard. It left RH without their leader; Gamma essentially took over, but that made them feel even more like Muscle Outlaw’z. It was also not a great move for Shingo, who has always been a better heel than babyface (see: his run right now!) but they essentially panicked and tried to shoehorn him in as top face, even having him take over CIMA’s position as leader of Typhoon, and none of it really worked. To their credit, they did recognize Shingo in Typhoon was a weird dynamic and played that into the storylines, eventually leading to Typhoon coming to a close and Shingo forming his new KAMIKAZE unit at the end of 2008. But in the meantime, Real Hazard was still down to five members already. Their sixth member and “replacement” for Shingo was not exactly the stuff of legend, either: Katsuo/Yuki Ono, the enormous Metabolic Brother of Tozawajuku (basically he was very fat, that was the gimmick he & Akira Tozawa had going at the time; Tozawa thankfully dropped it right around this time and went on a “Diet Series” that saw him lose the excess weight he had gained, but Katsuo basically remains a fat man to this day), suddenly announced he was quitting Dragon Gate. This turned out to be a ruse when the very mysterious Cyber Kongcito first appeared on August 27th. Yes, it was indeed the jobber Katsuo in a silly matching outfit with Cyber Kong. The gimmick was kind of funny but not exactly what Real Hazard needed to put them back on track as a serious threat. Kongcito wouldn’t last very long anyway, leaving the unit on December 21st when Kong forced him to unmask in his place to “satisfy” a match stipulation (it was supposed to be Kong’s mask on the line but for whatever reason Kongcito was accepted as a substitute) and then kicked him out of the unit. About the only thing keeping Real Hazard afloat during this 2008 period was the YAMAKong team, as the duo won the Open the Twin Gate titles from Doi & Yoshino on October 5th and would hold them until March 1st, 2009. Other than that, the group wasn’t really doing a whole lot as 2008 came to a close. 2009 was a new year though, and would see the Real Hazard unit shake up its membership in a lot of different ways. The first big movement came on January 15th. For weeks leading up to this night, Yasushi Kanda & Gamma had been unable to get along, engaging in a memorable storyline where they at first began throwing powder in each other’s faces truly accidentally, before they just started doing it to each other on purpose (becoming less and less concerned with whether or not it looked like an accident). The two were eventually booked in a match against each other on this show with the loser having to leave RH. Gamma won the match, and went to eject Kanda from the unit. At this point Keni’chiro Arai, who had been without a unit since the end of Tozawajuku back in mid-November, came out to assist Kanda. Shockingly, the rest of Real Hazard then attacked Gamma, apparently siding with Kanda! The end result of all this was, despite the result of the match, Kanda stayed, Gamma was gone, and AraKen had joined. AraKen returned to his heel roots, as his original character had been a violent drunk ruffian who reformed his ways very early on in Toryumon Japan. But nearly seven years later he devolved, quickly developing a weapons-based fight style to go along with a problem drinking habit, and he would become one of the most important heels in RH. Meanwhile, Gamma’s exile made YAMATO the new leader of the unit. The status of Gamma in Dragon Gate as a whole was put into question, as Real Hazard began suggesting he should just leave DG. We’ll get back to this in a moment. RH wasn’t done adding new members yet, though, as KAGETORA officially joined just a week later on January 25th. KAGETORA was originally a member of Toryumon X, debuting first as the mini-SUWA SUWAcito before eventually breaking out on his own in Michnioku Pro & dragondoor. After the Dragon system competitor promotion El Dorado (essentially the follow-up to dragondoor, featuring Aagan Issou, other T2P/Toryumon X-era wrestlers, and a few other assorted DG dojo drop-outs) closed at the end of 2008, KAGETORA showed up in Dragon Gate with a promise to wreak havoc on the promotion. This made his official announcement that he was joining the heel Real Hazard unit a logical one. However, his stay in RH wound up not lasting very long; he found himself unable to get along with AraKen & Kanda, among others, and turned on them on March 1st when he helped Susumu Yokosuka & Gamma take the Open the Twin Gate titles from YAMAKong (in a match that would have seen Gamma banished from DG had they failed to win the belts). Following the title win was the formation of the new WARRIORS-5 unit, whose initial members were Susumu, Gamma, KAGETORA, the returning CIMA, and rookie Youhei Fujita, whose name I struggle to type without vomiting all over my monitor (for those who don’t know, Fujita- who renamed to RYOMA here- wound up being a central player in one of DG’s darkest hours, an animal abuse scandal at their dojo, and would be gone from DG within a year). There’s one more early 2009 addition to talk about however, and unlike KAGETORA this one would stick around for a while. Ryo Saito had gone from 2006’s breakout wrestler (KING OF GATE winner and Dream Gate champion, albeit with no successful title defenses) to primarily a tag wrestler in 2007 and 2008. As you may recall, Ryo’s longtime Maraha Isappa partner Genki Horiguchi had gone heel at the start of 2007, leaving Ryo to form a new team with Susumu Yokosuka (the wrestler who had taken the Dream Gate from him, in fact!) when they both ended up in Typhoon. The RyoSuka team was very successful and popular, as they were the IJ Tag Team Champions in 2007 (defeating Gedo & Jado for the titles, in fact) and had a nearly 5-month Twin Gate reign in 2008. But when Typhoon was brought to a close at the end of ’08, losing a Unit Must Disband 3-way with WORLD-1 and Real Hazard on 12/28 at FINAL GATE, it left Ryo’s future very much in question. He began talking of plans to start his own unit, trying to recruit away BxB Hulk from WORLD-1 to join he & Susumu. YAMATO cryptically challenged RyoSuka to face he & Kong for the Twin Gate, and that match took place on February 15th, 2009. But Ryo shockingly turned on his partner and allowed Susumu to be pinned, joining up with Real Hazard. This was a huge deal at the time, as Saito transformed overnight from his child-like character (even when he had briefly been a heel in Do FIXER, it was in kind of a “what did they get this child into” vein) into a vicious, mohawk-sporting heel who liked to attack people with chains and cut off their hair. I was really into heel Saito during this time, and he & Genki quickly reformed their famous tag team in RH and were rewarded with the Twin Gate titles on May 5th. Yet more unit movement came a few short months later. For a few months in the spring of 2009, YAMATO had been the latest wrestler to suddenly decide he didn’t need heel tactics after all (as you may have noticed from back in part 1, “wrestler decides he’s actually too talented to need heel tactics” is kind of a running theme here). He started asking the other RH members not to interfere in his matches after their attempts had backfired a couple times. He then departed for the NJPW Best of the Super Juniors tournament and, despite not winning many matches (he went 2-4-0 in the league) he made an impression on pro wrestling fans with his performance. When he did finally return to DG he at first simply refused to team with anyone in RH. Finally on June 26th Ryo & Genki came out and asked him to rejoin them; unsurprisingly YAMATO refused, then announced a “joint struggle” with Shingo Takagi, ultimately joining Shingo’s KAMIKAZE unit (he & Shingo would go on to beat Ryo & Genki for the Twin Gate titles a few months later in September). The other movement of the evening came when Dr. Muscle aided Ryo & Genki in retaining their titles against CIMA & Gamma in the main event with a protein powder attack. He unmasked to reveal m.c.KZ of WORLD-1, who for months had been frustrated by his inability to gain any rank in the unit. m.c.KZ would rename to Kzy the following night, also taking on a completely different look (the one you’re probably familiar with if you’re a recent DG fan), and would go on to be the longest serving heel in Dragon Gate history, not returning to the babyface side for the next six-and-a-half years (thus making him the only wrestler to be in every heel unit from this point forward through MAD BLANKEY). With all due respect to Kzy though, losing YAMATO and gaining Kzy was a pretty big step down for Real Hazard. YAMATO had already become a top-line player in Dragon Gate, and Kzy was still a guy finding his way out of the bottom of the card (one can argue he hasn’t really found it to this day, brief Brave Gate reign aside). YAMATO had also served as RH’s leader since Gamma’s exile, and after he chose to step down many thought it was going to be Ryo Saito stepping up as leader next. But somewhat surprisingly the man recognized as leader of the unit from this point until its end was actually Keni’chiro Arai. While AraKen was Saito’s senior in wrestling by a few years, he had yet to reach the type of heights as SaiRyo had a few years earlier (King of Gate, Dream Gate, etc.) so this was a little baffling at the time. 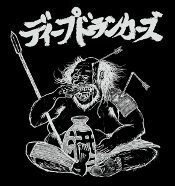 Regardless of who their leader was, this is also where the unit began heavy participation/assistance from Tokyo Gurentai. Gurentai (mostly Nosawa Rongai & Masada in DG) had been around a bit already- they assisted the Muscle Outlaw’z every once in a while and were around helping RH soon after they had first formed a year earlier- but the summer/fall of 2009 was probably their most regular period as RH assistants, as their appearances became more and more frequent (and higher profile). Obviously whatever you think of the Gurentai dudes will color your perception of this as either a good or bad, but personally I’ve never liked them, so their heavy involvement during this period turned me off on RH even more. Things would finally look to be picking up again for Real Hazard once Dragon Gate entered the last months of the year, however. At this point a “generation war” broke out between the Veterans and the New Generation, with CIMA especially being gung-ho about it (and forming the very first incarnation of Team Veteran, a loose partnership with the Zetsuirins trio that wasn’t a real unit just yet). This also lead to the return of Takuya Sugawara, who was brought back by Masaaki Mochizuki to aide Team Veteran in an angle that really did not make any sense at all. This is because Doi & Yoshino were considered on the “new generation” side, in fact the leaders of it really with Doi as Dream Gate champion at the time, and Sugawara actually debuted after the two of them! He was the very last T2P wrestler to debut, while Doi & Yoshino were both there for basically the entire T2P class. Regardless of this completely nonsensical plot hole though, Sugawara’s return was a pretty big shocker at the time, as he was the first of the exiled Aagan Issou members to return to Dragon Gate (on November 6th, 2009). Around this time the masked Dr. Muscle began reappearing with Ryo Saito and attacking BxB Hulk, going after his hair. Given this Dr. Muscle’s build/moves/mannerisms, people immediately began suggestion it was WARRIORS-5 member Susumu Yokosuka, which made sense as Susumu seemed very unenthused at the entire idea of the generation war and was starting to have dissension with the other W-5 members over it. But even as it seemed they were about to gain a new member, Real Hazard lost one first. On November 15th, Dragon Gate announced they had released Cyber Kong from his contract. He had supposedly requested the release due to an injury that wasn’t healing well at the time, and Kong was thus gone. Whether this was a shoot release or not I can’t really say, but I would assume it wasn’t; Kong ended up returning on February 3rd, 2010 (or less than three months later), though surprisingly he came back at Shingo Takagi’s request and joined Shingo’s KAMIKAZE unit, turning face and rejoining his former New Hazard partner. Back to late 2009 though: as expected, Dr. Muscle would reveal himself to be Susumu Yokosuka on December 3rd. Susumu reuniting with Ryo after Ryo had turned on him earlier that very year was kind of unexpected, to say the least. But in the generation war context it did make sense: suddenly Real Hazard was looking like a place for the guys who didn’t quite consider themselves Veterans, but weren’t New Generation either. Susumu, Kanda, Saito, and Genki, as you’ll recall from my piece on the generations in DG, could all basically be considered 2nd gen. Only AraKen (who would really be considered a solid 1st Gen veteran) and Kzy (who was a DG trueborn) didn’t fit in with this new 2nd gen theme of Real Hazard. Due to the general chaos that was going around at this time, a six-way cage match was booked as the main event for FINAL GATE 2009, featuring Masato Yoshino & BxB Hulk from WORLD-1, Dragon Kid from KAMIKAZE (although he wasn’t getting along with them due to all this generation war stuff and would leave for WARRIORS-5 soon after), MAZADA from Tokyo Gurentai (and an associate of RH), and both Saito & Susumu from Real Hazard, with the loser having to either shave his head or unmask in the case of Dragon Kid. The RyoSuka reunion was a huge focus as they targeted Hulk with gusto, looking to take his hair (Saito and Hulk had been at odds off-and-on all year so this was mainly a continuation of that). Just as things looked to be getting really interesting for RH again, however, a major injury would strike: on December 15th, it was announced that Ryo had suffered a ruptured Achilles tendon, putting him on the shelf indefinitely. Ultimately this ended up removing him from Real Hazard, as by the time he finally returned the unit no longer existed. Meanwhile, all of Saito’s upcoming matches- including his spot in the six-way cage match- saw him replaced by a mysterious X, who was apparently a new member of Real Hazard. On December 20th, Genki Horiguchi called out X, and out came K-ness! K-ness hadn’t been in a match in Dragon Gate since teaming up with Dragon Kid on August 30th, and hadn’t been in a real unit since the end of Final M2K almost three years earlier, but suddenly the oft-injured fan favorite had made a shocking return to his heel roots with Real Hazard! K-ness returning also reunited 3 of the original 4 members of Do FIXER (Susumu/Genki/K-ness) with only Magnum TOKYO missing (and he was long gone at that point), for the first time since Susumu & K-ness had left the unit to form Final M2K back in July 2004. Longtime fans were very excited at this turn of events, to say the least. Then came FINAL GATE on December 27th, and a number of interesting things happened here, all of which involved RH. First of all, Takuya Sugawara took on Dream Gate champion Naruki Doi in a non-title match (and it’s worth noting Doi was a record-setting champion at this point, having made 8 successful title defenses and gone over a full year with the title) and shockingly defeated him, with a little help from a guitar-wielding Dr. Muscle. Everyone assumed this was going to turn out to be Ken45°, a former Toryumon X wrestler (as Pineapple Hanai, one of the salsa-loving Los Salseros Japoneses) who frequently used the guitar as a weapon, but unfortunately for him Ken would suffer an injury soon after and other than one appearance at a small show in January was pretty much gone from DG before he ever really started. Still, the fact that Sugawara was being assisted by someone under a Dr. Muscle mask was a bit of foreshadowing. One match later, the trio of Yasushi Kanda, Genki, and Tokyo Gurentai’s leader NOSAWA Rongai came up short in challenging the Veteran army’s Masaaki Mochizuki, Don Fujii, and Akebono (yes, THAT Akebono; he made occasional appearences in DG for most of the year, through about August 2010; he was then gone until coming back for one match in May 2013 but hasn’t been seen since, thankfully) for their Triangle Gate titles. Real Hazard turned on NOSAWA after the match, thankfully ending the Tokyo Gurentai’s relationship with the heel unit in Dragon Gate after many long years (dating back to MO’z in fact); unfortunately for us, the Veterans came to his aide and he shook hands with them, so their occasional participation would continue (though not to the same degree as we saw in 2009). Finally the main event six-way cage match came down to Masato Yoshino and Susumu Yokosuka, after Yoshino had given up many opportunities to escape himself in order to help his unitmate BxB Hulk get out of the cage and save his hair instead. Just when it seemed like Yoshino was going to escape and leave Susumu to get shaved, Takuya Sugawara suddenly appeared out of nowhere and nailed him with the red box (the same color box that Aagan Issou used to use, in a cute little callback). Susumu then called out Ryo Saito’s name before using the Double Cross (the move Saito had in fact invented after turning on Susumu back in February, which was again interesting) on Yoshino and then escaped, leaving our poor SPEED STAR to get his head shaved. Perhaps this wasn’t a surprise considering Sugawara had been a heel the last time we saw him in DG nearly 5 years earlier, but he officially joined Real Hazard. 2009 then ended with the rather bizarre image of the various Real Hazard members all climbing on top of the cage and drinking beers, in some ways a fitting end to an equally bizarre (and sometimes awful, mainly due to all the out-of-ring unpleasantness) year. During the traditional break at the start of 2010, Genki Horiguchi made a surprising post on the Real Hazard blog. He declared that RH would win matches more through teamwork this year, rather than through interference and the use of weapons. On January 10th he tried to live up to those words by stopping Yasushi Kanda from using the blue box against their opponents, but Kanda clearly wasn’t pleased (and ended up winning the match via low blow & school boy anyway, displeasing Genki). The next day RH got their first championship win in a while, as K-ness defeated Naoki Tanizaki of WORLD-1 for his Open the Brave Gate title, K-ness’ first-ever singles championship reign in Dragon Gate. He promised to hold the title forever since he was finally back at 100% and “no one could beat him”. But it wasn’t all good news for RH, as Kanda and Genki again had issues, Kanda accidentally hitting Genki with the blue box to cost he and Susumu a tag match. Meanwhile, Dragon Kid officially left KAMIKAZE for WARRIORS-5 (giving them….three members! the disgraced RYOMA had just left the company following a long suspension, Susumu left last year, and KAGETORA was at this point missing from DG entirely), which isn’t important to the heel unit just yet but will be eventually! On January 16th the saga of the missing KAGETORA (who had basically gone MIA back at the end of December) came to a close. A Dr. Muscle seconded Kzy for his match against BxB Hulk, and eventually pulled his mask off to reveal he was KAGETORA, joining Real Hazard for the second time. Meanwhile, the main event was Susumu, Genki, and K-ness against CIMA/Gamma/DK of WARRIORS-5, and the RH trio refused Kanda’s assistance, ultimately losing when DK pinned Genki. This obviously upset Kanda greatly as things continued to deteriorate. But now a clear split in Real Hazard was forming: Susumu/Genki/K-ness as the “clean fight” side of RH with Kanda/Kzy/AraKen/Sugawara all seemingly as dedicated as ever to the cause of cheating (it was impossible to know newcomer KAGETORA’s position at this point, as well as Ryo Saito due to his prolonged injury absence). This in-fighting continued on as we went into the January 20th Korakuen show, which left poor KAGETORA already regretting his choice to join such a dysfunctional unit. Sugawara again pinned Doi, this time in a 3-way match with Shingo Takagi, after Kzy interfered with a powder attack. Suga, as one would expect, thought he should be the #1 contender as a result, but YAMATO stepped in and pointed out both of Sugawara’s wins had come with heavy interference. He demanded the title shot for himself instead, so a #1 contender match between them was thus determined for the next month’s Korakuen, in a No Rope match to boot. The rest of January into early February continued with the two sides of RH arguing and fighting and costing each other matches, KAGETORA caught in the middle and generally looking unhappy with his life choices. An increasingly despondent KAGE began asking the “wise sage Tozawa” (…) for advice, and Tozawa essentially began acting as his life coach and mentor. This saga finally reached an end following the February 10th Korakuen show. K-ness, Susumu, and Genki all withdrew from Real Hazard, though the K-nessuka tag team also decided they would no longer team with Genki. Genki’s slump had seen him get pinned in nearly all the matches the three fought as a trio for the past month or so, and not wanting to hold them back Genki voluntarily agreed not to team with them anymore. RH, meanwhile, swore revenge on all three. In the main event of that 2/10 show, YAMATO defeated Sugawara to become the Dream Gate #1 contender (he would go on to defeat Doi and finally end his year+ title reign a month later at Sumo Hall) with help form a mis-aimed KAGETORA guitar attack. A furious Kzy challenged KAGETORA to a match the following night in Chiba with the loser having to leave RH, and Kzy won with help from the rest of the unit, ejecting him. KAGETORA would later join his “wise sage” Tozawa in KAMIKAZE, after KAMIKAZE won a KAGETORA contra KAGETORA match against WARRIORS-5 for his, uh, possession. Meanwhile, on February 27th K-ness lost the Brave Gate to Super Shisa, ending the “unbeatable champion”‘s reign at just 47 days. So the end result of all this was that Genki was out on his own, K-nessuka were on their own as a tag team without a unit (and pledged to focus on realizing their strength as a team), and KAGETORA was with KAMIKAZE (hilariously he spent just 3 weeks with RH, or even less time than his previous 1-month stay with the unit back in early 2009). Genki would join WARRIORS-5 a few weeks later, and as a condition of his joining this also meant that Ryo Saito was at least promised a spot as well (now that they tentatively had 5 members again finally, WARRIORS-5 celebrated by….promptly changing their name to just WARRIORS, for some reason). Ryo would finally return at the end of April in an almost amnesiac, child-like state, but at first refused the spot in WARRIORS hoping to again reunite his tag team with Susumu. And now here is why I bring this up: Susumu rejected Ryo, both pointing out he was obviously back to teaming with K-ness but then also told him an amazing little story: had Ryo not gotten injured, Susumu’s participation in Real Hazard would have ended with Susumu turning on Ryo to pay him back for Ryo turning on him at the start of 2009! If Susumu was telling the truth here (and I guess I have no reason not to believe him), everything would have made sense in the end with the Susumu turn, as it was all a ploy for him to get revenge on Ryo. Stupid injuries! Anyway, having been rejected by Susumu/informed that their late ’09 reunion was just a giant lie, a dejected Saito finally took that open spot in WARRIORS, reforming his Maraha Isappa tag team with Genki instead. Overall Impact/Legacy: The best thing I can say to sum up Real Hazard is “wasted potential”. The original formation of the unit, with Kong & Shingo of New Hazard coming together with what was left of Muscle Outlaw’z, was an exciting start that looked like it would freshen things up on the heel side at the time. That went to hell within a few months and the unit ended up virtually directionless for the rest of 2008. 2009 started out pretty good with the shock heel turns of Ryo Saito & Keni’chiro Arai, but most of it saw far too much participation from the talentless slugs of Tokyo Gurentai. And when things picked up again in late ’09 with Susumu’s equally shocking turn and the super-exciting heel RyoSuka reunion, that got derailed in a couple weeks too due to Ryo Saito’s injury! Again, look at what Susumu told Ryo when he returned in April: that sounds like such a cool scenario that was supposed to have played out! Who even knows who the heels would have been- would Susumu turning on Ryo again, justified or not, had made him the heel in the feud? Would K-ness still have returned to aide Susumu (he seemed oddly prepared to step in, which makes me think he just came back early due to the Saito injury)? Would the Real Hazard split still gone down the same otherwise with the same people ending up on each side, in about the same timeframe, or would it have been very different? None of these questions can ever really be answered, but they’re fun to think about! But again, unanswered questions and what if’s basically sum up Real Hazard as a unit. They had a cool (and creepy/unsettling) entrance theme, cool logo and color scheme (a color scheme that was basically repeated for Blood WARRIORS a few years later, in fact, maybe just with less emphasis on the black), and definitely had their fair share of great members. But was the unit ever really great, other than maybe a few weeks here or there? Nope, not really. And even the dissension period was pretty lame, with sides very clearly staked out from the start, a pretty out-of-nowhere beginning (why did Genki suddenly decide he wanted clean fights and make a blog post about it? why did K-nessuka, who had just turned heel presumably to be heels like weeks earlier, just agree with him and go along with it even as he got pinned constantly, before then just abandoning him at the first opportunity?) and an abrupt end. It definitely couldn’t hold a candle to the dissension period in Muscle Outlaw’z, or the chaotic, shocking end of Blood Generation. Overall, this was just a pretty lame unit, looking back on it. They were fun when they first began and maybe also in December ’09 (after Susumu joined but before the dissension started), but they were also pretty useless and boring a lot of the time. Just say no to Tokyo Gurentai, kids, because their frequent presence is one of the biggest things that sunk this unit for me. After continuing on as Real Hazard for the rest of February, the quartet of AraKen, Kanda, Sugawara, and Kzy made a big announcement on the March 3rd Korakuen. They revealed they were dropping the RH name, replacing it with a new one: Deep Drunkers. Of course, this reflected their love of alcoholism (especially AraKen but the rest of them too, to a lesser extent) and general hooligan-ness. Kzy especially began to look more and more like a violent, vagrant ruffian of some kind by the day during this period. Deep Drunkers almost immediately settled into more of a background role than the heel unit had ever taken in DG (with the possible exception of Aagan Issou, who were also pretty much lost after the Toryumon/DG changeover happened). This was pretty understandable given that they had just four members, none of whom would be considered the highest-ranked members of the roster. Indeed, DD’s credibility problem was obvious from the start. They simply had no one on the level of even the injured Ryo Saito or departed Susumu Yokosuka, let alone someone on the level of a CIMA, Doi, or Shingo. The story then of Deep Drunkers is one of every signboard player in Dragon Gate deciding to spend most of 2010 as babyfaces (at most you could refer to a few guys, like that year’s Shingo/Kong team, as tweeners, but they definitely weren’t traditional heels), creating a rather strange dynamic where DD almost seemed to be an afterthought a great deal of the time. Perhaps nothing summed them up better early on than when the four of them actually lost a 4-on-2 handicap elimination match to K-nessuka at the end of April (granted, the babyfaces received some unexpected assistance from a returning Ryo Saito, which lead to the Ryo/Susumu reveal I outlined above in the RH section, but still, that’s….embarrassing). To be fair to the Drunkers, they followed up that ridiculous loss by winning the Open the Triangle Gate titles from the Veteran-gun trio of Mochizuki, Fujii, and Akebono on May 5th at DG’s big DEAD OR ALIVE show, Kanda pinning Fujii with a chair-assisted elbow drop in a No DQ match. However the reign of he, Kzy, and Sugawara would last just 8 days, as they were then defeated on May 13th for the titles by WARRIORS’ CIMA, Gamma, and Genki Horiguchi at Korakuen Hall. 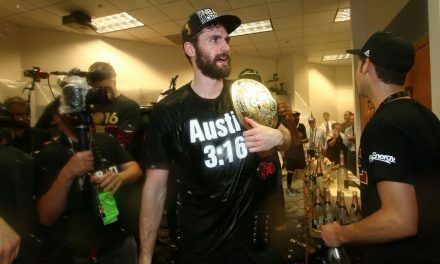 In another example of “yes, they were that useless and pointless”, this 8-day title reign marks the only championship reign in the entire run of Deep Drunkers! They did not win another championship, not even another Triangle Gate reign, not even the freaking Owari Gate, for the rest of their existence. If you’d like another example of their general uselessness, what did Dragon Gate’s only heel unit do for the biggest show of the year, the annual Kobe World Hall show on July 11th? They jerked the curtain, as the trio of Kzy/Kanda/AraKen defeated the top-tier opponents of Mark Haskins, Naoki Tanizaki, and friggin’ Kotoka in an 8-minute match when Kzy pinned Kotoka. That’s it. That was the entirety of their participation in World 2010. Perhaps one can’t really blame them, because though we didn’t know it at the time the unit was down to just three members at this point. Takuya Sugawara, who had been provoking WORLD-1’s Naoki Tanizaki for a while, pinned him in a singles match with his own Implant finisher back on July 8th at Korakuen Hall. That would end up being Sugawara’s last appearance in DG until the night DD officially disbanded over three months later. August brought little change for Deep Drunkers’ fortunes. 2010’s Summer Adventure Tag League took up much of the month, and of course with just three members the Drunkers could only enter 1 team (Kzy & Kanda). The team did about as well as you would expect, which is to say of course not well at all: they started the league with three straight losses to Maraha Isappa of WARRIORS, Shingo/YAMATO of KAMIKAZE, and Hulk/Tanizaki of WORLD-1 (the W1 B-team, actually, since they also had SPEED MUSCLE of Doi & Yoshino in this; DoiYoshi would go on to win it for the third and final time, by the way). Once they were already well out of the running they finally received their first victory of the tournament, over Mochizuki and Don Fujii….by disqualification! So yes, they went 1-3 for 2 points, and their only victory came by DQ. You’d think I was making this stuff up to fit my narrative at this point, but nope, this is all how it really happened! They really were booked that weakly. As August moved into September, we received our first signs of unit strife. In WORLD-1, Naoki Tanizaki was having issues with his teammates, getting into arguments with his fellow members. In addition, Naruki Doi and BxB Hulk were getting into arguments as well. Masato Yoshino, who had just won the Open the Dream Gate title for the first time by defeating YAMATO back in July at Kobe World (this becomes important to us in a second!) attempted to play peacekeeper, but things were breaking down quickly. A 3-way match between Doi, Hulk, and Naoki was signed for 10/3 at Kobe Sambo Hall to hopefully let them get things out of their systems and settle back down again. Meanwhile, Deep Drunkers finally seemed to be tired of losing all the damn time, as AraKen and Kanda especially had started arguing after their frequent losses. A mysterious Dr. Muscle appeared and forced them to shake hands, but tensions remained high. Everything came to a head on September 17th at Korakuen Hall. Naoki and Hulk were in a 3-way tag team match that saw Naoki cost Hulk the match with a misaimed blue box attack. They nearly came to blows afterwards when another Dr. Muscle ran out and stopped them, before giving Hulk Naoki’s Implant move. He went to shake hands with Naoki, who refused for now. The main event was an Open the Twin Gate title match, as K-ness & Susumu defended against the Summer Adventure Tag League winners Doi & Yoshino. Naoki came out and gave the Implant to Susumu AND Yoshino, but then dragged Susumu on top of Yoshino and allowed him to be pinned. Following the match he finally, officialy joined Deep Drunkers, giving them a fourth member again for the first time since Sugawara’s disappearance (if you don’t count the mysterious Dr. Muscle who was appearing frequently in this period, which you should not honestly!). An infuriated Doi immediately laid down a challenge to the Drunkers for a Losing Unit Must Disband match between the two groups, which was booked for the following month’s Korakuen show. Even though Naoki had never been the highest ranked member of the roster, at least his infusion into the unit gave them something resembling life again. Naoki tapped back into his old punk heel character and ran wild. He even managed to come out on top in the October 3rd 3-way match with Doi and Hulk, even though it was technically a 2-on-1 advantage for WORLD-1. Kzy interfered and took out Doi’s knee, leaving him with no choice but to tap out to a half crab from Naoki. Naoki then pinned Hulk with the Implant in what was probably his biggest win to date, even dating back to his Brave Gate reign. Then came the October 13th Unit Must Disband match, a one-fall match with WORLD-1’s Doi, Yoshino, and Hulk facing Deep Drunkers’ Naoki, Kzy, and Kanda. After about 18-and-a-half minutes Doi pinned Naoki with his signature V9 clutch flash pin, putting a merciful end to this awful unit. However, it was in the post-match that things really got interesting, and we’ll discuss that next when we talk about the following heel unit! First though let’s wrap up Deep Drunkers. Overall Impact/Legacy: You’ve probably long since figured this out already, but I did not care for Deep Drunkers. They were easily the weakest heel unit of all-time and one of the worst units in all of Dragon Gate/Toryumon history (with only really Shin M2K giving them a run for worst unit of all-time period, I think). They never had a chance from the start, really. I was about as big of a Takuya Sugawara fan as there was back in his earlier Toryumon days, and even I grew tired of his DG return after a while. He was simply too out-of-shape, his fitness level not nearly high enough to keep up with the torrid pace of DG multi-man tags, and he stood out like a sore thumb as a result. I think the original idea for this unit was that Sugawara was going to be the top-line player- remember, they gave him two pins over Naruki Doi back when Doi was the unbeatable Dream Gate champion in late 2009/early 2010, so clearly they had something resembling plans and faith in him- but they probably saw the writing on the wall with him and his push was scaled back very quickly. Even though he hung around for a while and, unfortunately, would be back, he was never at the level he first returned at again. That hurt this unit a lot, as there was really no one else here to step up. Kanda, Kzy, and AraKen are all solid enough hands (and this is coming from someone who loves Kanda and Kzy especially, to be clear) but none of them have ever been seen by DG as top-line player material. And for whatever reason, no one was turned. We were just left with a completely floundering heel unit for basically 8 or 9 months of 2010, which is kind of ridiculous and definitely hurt the overall quality of the year a lot. The only thing I will really say in defense of Deep Drunkers is that, after covering the insane amount of movement/member changes/etc. involved in Muscle Outlaw’z and Real Hazard for this series, I have newfound appreciation for their stability! But ultimately they kind of just were what they were, which was pretty much a joke for basically their entire run. The “peak”, if you can call it that, was basically the last month with Naoki’s addition injecting a little bit of life into the group, but they really were just awful otherwise (and this peak wasn’t even that high either). I can’t say it enough- the Drunkers were a horrifically bad unit. 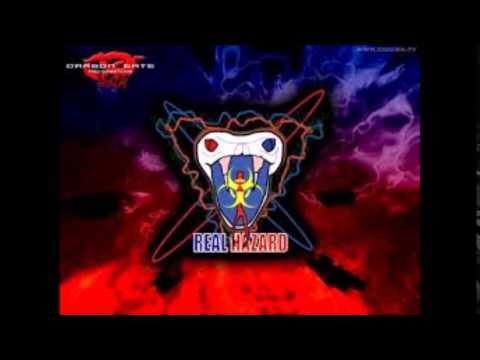 As bad as Real Hazard were at times too, at least they had a cool logo, cool theme music, and an interesting color scheme. Deep Drunkers never even had that going for them. Their theme song was one of my least favorites in Dragon Gate history, with the guy belching to start (yes it was kind of funny, but again, I’m not sure you’re trying to get laughs with the theme song for your top heel unit right?) and the song just kind of meandering along from there in a way that didn’t even sound particularly heelish (especially the chorus). Anyway. This unit was very bad and we should probably just move on. So back to the end of that Unit Must Disband match between WORLD-1 and Deep Drunkers on October 13th. After Doi pinned Tanizaki with the V9 Clutch, forcing the end of Drunkers, Naoki immediately began complaining about the indignity of losing a unit’s existence to a flash pin. A big brawl broke out and Masato Yoshino eventually had Naoki set up for the Bakatare Sliding Kick, but in one of the most surprising moments in Dragon Gate history Doi instead nailed Yoshino with it instead, turning on his partner of 4+ years (for the first time, anyway)! A massive beatdown followed as Doi hit Yoshino with the dreaded red box and then gave him his Muscular Bomb uber-finisher, while Naoki delivered the Implant to BxB Hulk. Kanda used a chair to take out Kotoka and then delivered Ryu’s to PAC when the two fellow W-1 members tried to make the save. Doi then took the mic and revealed his very simple motivations for all of this: WORLD-1 were supposed to be the minions of Doi, responsible for helping him hold onto the Dream Gate title. Yoshino was not supposed to have Dream Gate aspirations of his own, let alone beat the man who ended Doi’s year-plus reign! In essence, it was petty jealousy and resentment of Yoshino that lead Doi to this drastic step. He announced he was leaving the unit he helped start to instead lead the ex-Drunkers. At this point Keni’chiro Arai (who had not really been involved in the post-match brawl at all) attempted to intervene and question how this was allowed when the Drunkers had lost a Unit Must Disband match. Poor AraKen was told flat-out by Kzy that this was not a continuation of Drunkers, but it was a new group and he wouldn’t be part of it! Kanda then nailed his former leader with a chair, leaving him laying as well. Finally, the mysterious Dr. Muscle that had been hanging around the Drunkers for the past month+ unmasked, revealing himself to be…..Takuya Sugawara, to the delight of literally no one. Regardless though, Sugawara was apparently back from his sudden absence in Deep Drunkers, and was a part of this new unit too. WORLD-1 meanwhile did receive some immediate reinforcements in the form of K-nessuka; though they didn’t officially join the unit at first, that would happen just a few weeks later, ending the long period of the tag team being unit-less. Something I need to make clear here, that was never outright stated but was pretty much assumed by everyone, was that the Drunkers intentionally tanked the Unit Must Disband match. This is sometimes not understood by people, but for years the heel unit had never lost a Unit Must Disband match and people pointed to this one as the first time it happened. While technically true, the idea was supposed to be that Naoki allowed himself to be pinned by Doi’s flash cradle just so they could hatch their plan after the match, essentially replacing the “dead weight” of AraKen (their words, not mine) with the far superior former Dream Gate champion Doi. The heel unit would remain undefeated in Unit Must Disband matches for a number of years after this if you throw this one out, which you should because, in storyline, the Drunkers intentionally threw the match! Anyway, moving on…. Almost immediately Doi began teasing that there was something bigger going on than just him taking over the ex-Drunkers, even though that’s all it really was at first. Doi also refused to name the unit, saying “a name wasn’t necessary right now”, so that’s why they have the rather strange name of “Team Doi” listed here, which is what fans took to calling them (the color scheme changed to blue-and-black, by the way). With all due respect to Keni’chiro Arai, having an ex-Dream Gate champion like Doi at the helm instead of AraKen was a huge boost (and they had another boost coming shortly), and this short-lived group did much better than the Drunkers ever did as a result. At this point we need to talk about the WARRIORS unit- they were CIMA, Ryo Saito, Genki Horiguchi, Dragon Kid, and Gamma, with Ricochet and Brodie Lee being associate members from the Dragon Gate USA promotion. Gamma was involved in a vicious feud with K-ness calling back to the fact that they had been young boys in Michinoku Pro together, brawling all over the building on various shows in October 2010. On October 25th, Gamma made it clear he wanted to challenge for Susumu & K-ness’ Open the Twin Gate titles at the upcoming Gate of Destiny pay-per-view in Osaka. The problem was, his usual partner CIMA (together they were/are known as Osaka ’06) was busy that night already in the main event, challenging Yoshino for the Dream Gate, and was annoyed by Gamma’s increasingly bizarre requests for a partner. First Gamma wanted Ricochet brought over from the US to be his partner, but CIMA said it was too last-minute to get his visa situation sorted out. Then Gamma asked for Muscle Gang to be his partner; Muscle Gang, for those who don’t know, was a foreign member of the Muscle Outlaw’z who had not been seen in Dragon Gate since July 2007; he used a lot of other names but I suppose his best-known one was Babi Slymm. Anyway, this was an absurd request and everyone was completely exasperated with Gamma, who swore he would find a partner and have this title match with or without the WARRIORS’ help. Also taking place on October 25th was a big win for the still-unnamed heel unit, as the trio of Sugawara/Naoki/Kanda defeated WARRIORS’ CIMA, Gamma, and Genki Horiguchi when Naoki pinned Genki with the Implant. Yes, the new unit won a title faster than the Drunkers and held it for considerably longer than their 8 days, as well. I told you things improved for the heels. So fast forward now to November 13th, about 10 days out from Gate of Destiny. Gamma announced that he had found his tag team partner to challenge K-nessuka for the Twin Gate, and that partner was……Naruki Doi. Understandably this greatly upset WARRIORS, who told him that if he was teaming up with Doi he was now their enemy. So Gamma was out of WARRIORS and was now a strong #2 for Team Doi, turning heel for the first time since he was kicked out of Real Hazard in January 2009. Whatever you may think of Gamma, this was quickly becoming a far stronger lineup from a marquee perspective than the Drunkers could have ever compared with. Gate of Destiny was a big show for the fledgling heel unit. Doi & Gamma ended the 194-day Twin Gate title reign of K-nessuka when Gamma pinned K-ness with his Skytwister Press. In the semi-main, the Triangle Gate trio succesfully retained their titles in a 3-way 6-man against Veteran-gun of Mochizuki/Fujii/AraKen and KAMIKAZE of Shingo/YAMATO/Kong, with the Veterans being eliminated last by Kanda pinning AraKen with Ryu’s. The nameless unit was having great success, far beyond anything Deep Drunkers had ever achieved. After Yoshino retained his Dream Gate against CIMA in the main event, Naruki Doi appeared to challenge him for Final Gate. Yoshino at first refused- he was at this point dedicated to his Yoshino Lottery, drawing tiny balls out of a lottery box like he was picking Royal Rumble numbers or something- but Doi & Kzy broke the lottery box and pulled out Doi’s ball instead. For whatever reason Yoshino actually went along with this and agreed to the match. On December 2nd at Korakuen he announced he was in turn challenging Gamma & Doi for the Twin Gate, but surprisingly his partner was not a WORLD-1 member but WARRIORS’ CIMA! However GM Yagi informed them that they would have to vacate the titles immediately if they won them, since they were from different units and the rest of WARRIORS & WORLD-1 had not signed off on this. On December 5th, the heels got another big win, as they were taking part in a captain’s fall hair vs. hair tag with Kzy & Kanda facing WORLD-1’s Hulk and Kotoka. Poor Kotoka was pinned by Kzy with the Impact, of course, and was promptly shaved bald. Kzy & Kanda mocked him, pointing out he’d now have to go on his morning news show (for those who don’t know Kotoka was- or is? I’m honestly not sure- a field reporter for a popular morning news TV show) with a bald head and would surely be fired. Add that one to the “reasons why Kotoka eventually snapped” file, I guess! Around this time strange masked men in masks began appearing at Dragon Gate shows, randomly attacking various wrestlers. Most of them wore silver masks, but there was also one in a golden mask who appeared to be the leader. These would get an official name later (and that name is basically a spoiler, if you don’t know where this is going), but for now most people just called them “Metal Masks”. On December 21st at Korakuen, Team Doi and WARRIORS had a confrontation. Doi taunted CIMA that his unit now outnumbered the depleted WARRIORS, but CIMA countered with the Japanese debut of Brodie Lee (the man currently known as Luke Harper, of course), a WARRIORS International member from Dragon Gate USA. With Lee here and Ricochet coming, the WARRIORS were looking stronger than ever. However, he and Yoshino failed to win the Twin Gate from Doi & Gamma in the main event, as CIMA was pinned by Gamma. Final Gate came next on December 26th, and unfortunately for Team Doi disaster struck almost immediately, in the dark match in fact. Kzy was taking on Super Shenlong (the second incarnation of the character, the former Ape Kimata and future Mondai Ryu) when he broke his foot, forcing it to be stopped. He would not be seen again in Dragon Gate for many months, so this was basically his last night with the unit. This ended up being sort of an omen for the rest of their night, as the WARRIORS trio of CIMA, Dragon Kid, and newcomer from WARRIORS International Ricochet defeated Sugawara, Naoki, & Kanda in the semi-main, Ricochet debuting his double-rotation moonsault on Kanda to win the Triangle Gate titles. This would wind up being the last appearence for Takuya Sugawara in Dragon Gate proper (he turned up on a Unit Produce show in 2011 as well as one of Mochizuki’s Byuuden shows, but that was it) and thus was obviously also his last night in the unit. And in the main event, Doi was defeated by his former tag partner Yoshino (in a pretty boring slog of a match, to be honest with you), coming up short in his challenge for the Dream Gate. Following that main event, the Metal Masks appeared once again, their numbers having increased to six. After a struggle Yoshino & Hulk managed to capture one and unmask him, revealing…..another mask. He escaped before any further unmasking could occur, leaving us to wonder forever whether or not he just had an infinite number of masks under there. On January 10th there was another big loss for Team Doi, as the veteran tag team of Masaaki Mochizuki & Don Fujii defeated Doi & Gamma for the Twin Gate titles. Not much else of note happened here, so let’s move straight to January 14th in Osaka. Here is where you should play some ominous music, because the Metal Mask mystery was (finally) about to be solved. WORLD-1 had just defeated KAMIKAZE in a six-man tag team main event when four of the Metal Masks suddenly appeared up in the building’s balcony. Yoshino challenged them to come down to the ring, which surprisingly they complied with. A brawl broke out between WORLD-1 and the four Metal Masks, when suddenly five more Metal Masks came down to the ring, one of them being the golden Mask. One by one the Metal Masks suddenly started delivering signature moves to the WORLD-1 members, signature moves that reminded everyone of two units in particular. The last man to be laid out was Yoshino at the hands of the golden Mask, who gave him the signature thrust kick—>Schewin combo of a very well-known wrestler. Indeed, all of them then unmasked revealing the four remaining members of Team Doi (Doi, Gamma, Naoki, and Kanda) and the five members of WARRIORS (CIMA, Ricochet, Dragon Kid, Saito, and Genki). The two units shook hands, joining together to become one, bringing an end to Team Doi. The formal beginning of Blood WARRIORS comes on January 18th, when they got their official name. But, of course, that will have to wait for the final part in our Heel Units Timeline. For now we’ll just note that this entire thing made no sense, as CIMA and the rest of WARRIORS had been fighting Team Doi for months while the Metal Masks (who were officially named “Metal Warriors” whenever they appeared again, which is why I told you that was a spoiler!) were running around, so basically either there were a lot of plot holes or the WARRIORS and Team Doi went to a lot of trouble just to confuse us all for no reason. Anyway! That’s the end of Team Doi, and we’ll pick up with Blood WARRIORS in Part 3. Overall Impact/Legacy: It’s tough for the unit to leave an enormous legacy when they were only around for three months; indeed, at first I wasn’t going to include them at all, and you could certainly say they should have been mentioned in either the Drunkers or Blood WARRIORS section instead. However, upon reflection I do feel they were their own unit: they had their own color scheme and theme song, both of which were extremely cool (the black-and-blue was awesome and GLITTER was a really great theme, the dark nature telling you this was a far more serious unit than Drunkers right away; thankfully this song lived on as kind of a Blood WARRIORS alternate theme). The unit did kind of feel like a make-up or correction of Drunkers, giving the ex-Drunkers who stayed on more to do with the Triangle Gate run and injecting some much-needed credibility with Doi & Gamma. The mysterious, there’s-something-bigger-going-on stuff was fun too, even though the eventual reveal didn’t really make any sense. Overall, I enjoyed Team Doi and they were a necessary bridge to get us from the garbage that was Drunkers into the awesome Blood WARRIORS era that was about to begin. So that’s it for Part two, ten-thousand-plus words yet again! Hope you enjoyed it. We’ll see you back next week for Part three, as we finally wrap this sucker up by covering the last three heel units in Dragon Gate: Blood WARRIORS, MAD BLANKEY, and VerserK. See you then! NextSTR 136: Shane McMahon returns, but will he actually wrestle Undertaker?